Arizona is set to expand exemptions for vaccines as other states work to tighten them in an attempt to crack down on a nationwide measles outbreak. Last week, a state legislative panel approved three bills that would broaden vaccine exemption categories despite warnings from public health officials, reported the Arizona Republic. The committee, led by Republications, voted to create a religious exemption for schoolchildren, adding to the personal beliefs exemption Arizona already has. The measure would also get rid of a requirement for parents to sign a form from the state health department listing the risks of declining vaccines. Meanwhile, more than 150 measles cases across the country have been identified in 10 states and critics say, if the three bills pass into law, Arizona could be next. To obtain a religious exemption, a person must in their own words to defend their religious or spiritual belief that opposes vaccination. Two other measures were passed by the committee. One would require Arizona doctors to provide lengthy information about all the ingredients in immunizations. The other would require them to tell patients about an antibody test that may help determine if someone is already immune to a disease. But family physician Dr Steven Brown, from Phoenix, told lawmakers that these bills will make vaccine skepticism more acceptable. ‘Voting in favor of any of these bills and encouraging more exemptions for vaccinations is dangerous to our citizens and sends the wrong message to Arizonans,’ Dr Brown said. If the bills, pass in the state legislature, experts says this will lead to a rise in unvaccinated children. What’s more, a 2015 report found the rate in Arizona for the MMR (measles, mumps, rubella) vaccine to be the lowest in the nation at 84.1 percent, reported Cronkite News Service. 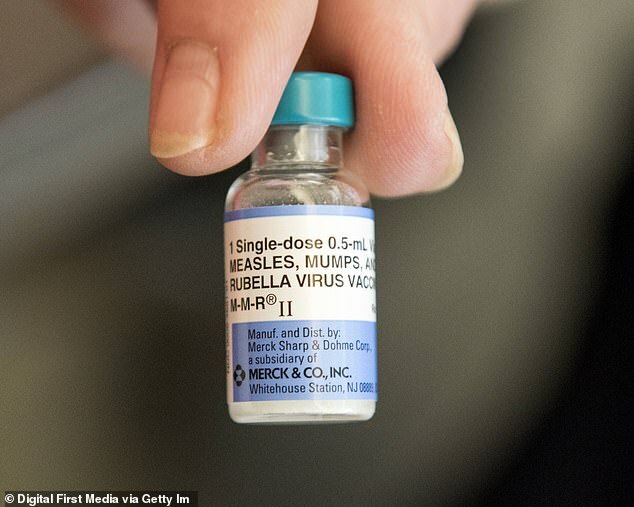 The Arizona Department of Health Services has warned that more than 5,000 kindergarten students would be at risk for measles if an outbreak hit the state due to poor ‘herd immunity’, according to the Arizona Republic. This is when the vast majority of a community – between 80 and 95 percent – becomes immune so that, if a disease is introduced, it is unable to spread. Therefore, those who are unable to be vaccinated, including the ill, very young and very old, are protected. Meanwhile, Washington has been working to increase its vaccination rates as the measles outbreak continues, affecting 159 people across the country. Last month, officials in the Evergreen State declared a public health emergency as 65 people in Clark County and one person in King County have fallen ill with measles. State epidemiologists revealed that staffing and supplies have cost the state more than $1million in taxpayer money. Two bills have been presented in Washington state’s Congress to limit the number of vaccine exemptions, reported KGW 8. One would ban personal or philosophical exemptions for the MMR vaccine and the other would ban personal or philosophical exemptions for all vaccines required for school. A third, stricter bill has been presented in Oregon’s Congress. This bill would ban all non-medical exemptions for vaccine, including religious reasons. In 2018, 372 cases of measles were confirmed in 26 states and the District of Columbia, the Centers for Disease Control and Prevention reported.